The Ultimate Guide to College Transfer is a comprehensive guide, designed to make college transfer between four-year schools as successful as possible. 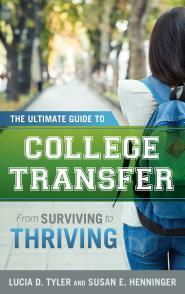 Chapters outline the steps to take from the moment a student finds him/herself considering college transfer to the first semester at his/her next college. The book contains vignettes (based on real student stories) and excerpts from interviews with transfer students, parents, and higher education professionals. The information and advice they share will be helpful, informative, and reassuring to families going through a college transfer and enlightening to high school and college personnel. College transfer, when done for the right reasons and in the right way, can be an extremely positive experience for students. This is especially true when the student goes from merely surviving in their old environment to thriving in their new one. Dr. Tyler provided us with a road map that allowed us to understand the steps and their sequence through this complicated process. Most important, she listened to all of us. Her vast and direct knowledge of higher educational institutions enabled us to narrow the field of choices quickly and start our college visits with very appropriate schools, saving us valuable time and expense. Thanks so much for helping me through my college selection process. Everything would have been so much more headache inducing without you guiding me. I'm really going to love college because you found a good fit for me.